Melt over medium heat, stirring until the ingredients are thoroughly blended. Set the mixture aside to cool. Whisk the egg yolks into the chocolate. Add one-third of the egg whites to the chocolate batter and mix vigorously. We cooked this recipe last night for a group of friends. It was a unanimous big hit! 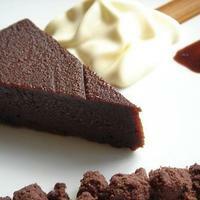 Yummy flourless chocolate texture and flavor and easy to make. We served it with Vanilla and Coffee ice cream. Also, my wife cut out some letters with paper and sprinkled it with powdered sugar so the letters were visible as brown on white. Very cute and easy to do! Thanks Ali! Super good. Had this with coffee ice cream and they went perfect together. The cake isn't too too rich and melts in your mouth. Two thumbs up! so GOOD! no doubt this deserves to be one of the top recipes! I actually put a shot of espresso into the recipe and it gave it a great taste! Unbelievable taste and simple to prepare. Highly recommend. Moist, easy to make and a real crowd pleaser. Great recipe. I cooked this one tonight and it came out great -- everyone loved it. A note of caution: the cake is very fragile, so be careful when flipping it onto the cooling rack, and don't try to use a spatula to move it. Cake easily separated from my nonstick cake pan (didn't need to use a two piece cake pan). I'll definitely be making this one again. This is the cake I have been looking for THANK YOU!!! Ihad some in a french style cafe, but they couldn't tell me anything about the cake! Not even what it was called. It was delicious but i had given up looking - despite living 15 miles from France! So thank you very much will be making this soon & I KNOW it will taste good!! This looks great! I have recently taken an interest in French food...think I may try this recipe! This sounds soooo good! Do you think this would do well with a thin glaze? ok - made mini versions this weekend with the exact same recipe but my over-achieving oven burnt the edges.... used what i could salvage in parfait desserts and it was a HUGE hits. I made this tonight. I decided to serve it warm right out of the oven. It was delicious. Reminded me of the Lava cakes! Very good I will make this again! Would be great for a dinner party! Very easty to make. Turned it straight from my pan on to my plate for decoration. Will make again. Sounds good. I might try this instead of Chocolate Decadence next time. This looks so filling and hearty. I am not a sweet tooth but would always like to try something new. i used to buy a cake like this at a patisserie in St Pierre.... now i can try and make it at home :) thanks for sharing! I've made this cake twice (9" spring form pan), in the last week for different functions. It's easy and very yummy! This looks delicious.I love the presentation.Looking forward to trying the recipe.Thanks!